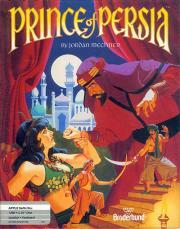 Prince of Persia is a 1989 fantasy cinematic platformer originally developed and published by Brøderbund and designed by Jordan Mechner for the Apple II. The founding title of the so-called "Cinematic Platformer" genre. With its stylish look, big puzzly level layouts, and rotoscoped animations, it certainly creates a strong impression. For better or worse, the animation method leads to some very exactingly precise controls, which make even the most action-heavy sequences a matter of very careful memorization and planning (hence the puzzly layouts). It's an undeniably bold design, even if it can feel frustratingly stiff to play. Has kind of an interesting smooth play control style but even as a kid I thought the rotoscope graphics look kinda weird and ugly. Once you get the hang of it, it's a pretty basic and simple game. I was real young and finished it. always struggled once i got to that level where you take the potion to go upside-down. Neat movement animations but quickly becomes just another platformer.